I've been painting a lot of miniatures lately and throughout the process I've been testing several different grips and stands for making the job easier and more efficient. Last time I reviewed Mini Grips from Death Ray Designs, but today I'm reviewing a more all-in-one option: The Hobby Holder. Only recently a Kickstarter, The Hobby Holder has started to penetrate the market with its smart and customizable design. The first thing you'll notice about The Hobby Holder is that it uses Bottle Caps as the point of contact between the miniature and its base. Weird, right? Yes, but also pretty awesome. Just screw a bottle cap onto the base and click on the handle and you're ready to go. Bottle caps are super cheap, so you won't feel bad about drilling through them to pin minis or adding various kinds of tacks to stick the base to the cap. In my case, since I magnetize everything, I glued a bunch of magnets to the underside of the bottle cap and now I have a magnetic surface for my painting. It works like a charm. If you'd rather use cork or something other than bottle caps, the base will hold almost anything with a little modification. Let me explain how the handle works... having the handle positioned upwards gives you a support for your painting hand, allowing you more stability for painting small details and relieving frustration that can come with shakier hands or grip fatigue. It's also great for holding the miniature at weird angles for painting. If you're painting miniatures, you want a grip that has one of these. Also, the base rotates for easy access to all angles of your mini! Keep in mind that the above picture is of a prototype, not the final plastic. The Hobby Holder is made of plastic, which I like quite a bit. First of all, it makes the entire thing easier to clean after you get paint all over it. I'm no pro painter, so when I paint I'll accidentally end up with paint where it shouldn't be and knowing that I can just wash that right off is a big plus in my book. It also makes The Hobby Holder pretty inexpensive. At $20 for the handle and base in various color options, you can customize the look without breaking the bank. This is a big part of the draw for The Hobby Holder. You can order Grips/Handles depending on your needs. 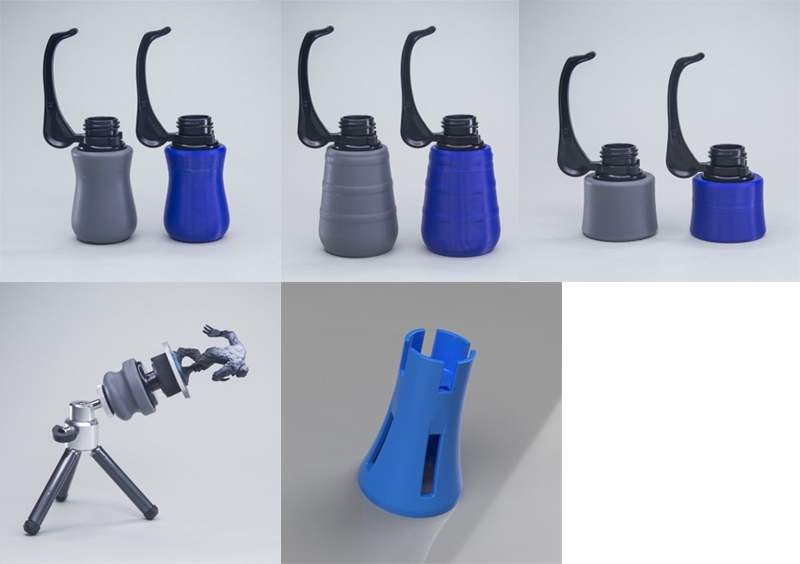 Five different grips are available including a tripod mount. I have only tested the #1 grip, which I'm told is their best selling option. It appears to be 3D printed and is very smooth and easy to hold. In addition, the handle of the The Hobby Holder can be turned upside down to give you a handle either alongside a handle mod or all by itself. I've found this to be comfortable and when you put it next to handle #1 or #2 it looks like a grenade, which is pretty fun. That said, I prefer to use the handle for its primary use, a rest/support for the painting hand. In conclusion, The Hobby Holder is a nice addition to the minis grip space. Its mid-range price point makes it affordable to customize. While it's not as cheap as Mini Grips, it's also cheaper than the Rathcore while offering most of the same features. And let's not forget that it's definitely more customizable than other grips. If you're looking for a single grip to paint with, this is a contender. Con: This is where I have to point out the only thing I don't like about The Hobby Holder, and this is specific to the Grip/Handle Mod #1. It's light, so when you have everything assembled and a metal mini on top (I paint Infinity, which are metal), the whole thing becomes top heavy and I'd had to tip over and fall many times. I've since removed the Grip/Handle Mod when working with metal. That said, you don't need the mod to use The Hobby Holder and you can also add weight to the grip to keep that from happening. If you're painting plastic miniatures it won't be an issue anyway. Check out The Hobby Holder and all of its customizable bits! Disclaimer: I was not paid to write this review. I did reach out to The Hobby Holder and request the product for review. They were very friendly and their customer service is top notch. I received my product for free and have used it extensively since then to get a feel for what I thought.